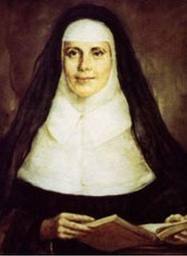 Catherine McAuley founded the Religious Congregation of the Sisters of Mercy in 1831. Her strong faith in God nurtured by reflection on the Gospels, her deep and personal awareness of the needs of poor people in Dublin in the nineteenth century and her loyalty to the Catholic Church led her to give her life in service to others. To bring freedom and a better quality of life to those who were poor. To regenerate Irish society by preparing young people for responsible adult living. The focus of her attention was those who were poor, uneducated and without opportunity, her approach was collaborative and she sought to influence those at the centre of wealth and power to share in her efforts. ‘She connected the rich to the poor, the educated and skilled to the uninstructed, the influential to those perceived as of no consequence, the powerful to the weak’. In 1854, following the Great Famine, the then Bishop, Dr. Moriarty, who had witnessed the work of the Sisters in Killarney, brought Sr. M. de Sales Bridgeman and Sr. M.M. Elizabeth O’Riordan to Tralee to help alleviate the problems faced by the sick and poor of the town. In 1855 John Mulchinock, a wealthy shopkeeper, impressed with the work of the Sisters, donated 16 acres of land at Balloonagh to the Order. The foundation stone was laid in May 1858 and the new convent was completed exactly three years later on May 21st. 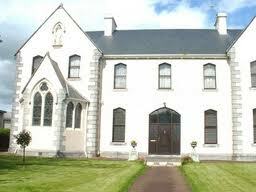 The year 1872 marked the birth of the Convent of Mercy in Moyderwell, in a large house owned by Dean MeEnery, P.P. of Tralee. On his death the house and large garden was handed over to the Order by his successor Dean Mawe. At the top of the garden were outhouses and stables, close to the present location of the Home Economics Room, which were converted into the very first classrooms at Moyderwell, known as St. Joseph’s. Boys and girls were enrolled and in a very short time some classes had to be taken under the shade of the lilac and laburnum trees in the garden due to the large numbers. As the overcrowding problem increased in the years ahead a decision was made to build a new Convent and School. The clergy in Kerry and the people of the town responded generously and the foundation stone was laid by Sir Henry Donovan of Seafield, Justice of the Peace, on April 14th 1878. In 1925 what was known at the time as the ‘Secondary Top’ was begun in Moyderwell, under the principalship of Sr. Anthony O’Leary. Her stewardship between 1925 and 1948 was to bring unparalleled reputation as an educational institution to the school. Students arrived from far away Dublin and Galway and some from Listowel and Rathmore, staying with relatives in Tralee in order to be educated in Moyderwell. In 1931 the demand for more room in the Secondary Top was satisfied when an old garage was bought and converted to three rooms and a bicycle shed known as St. Patrick’s Hall. First year classes, Leaving Certificate classes and the preparatory Exam classes, were located here while the Intermediate Certificate’s were taught in the ‘old’ School. In 1953 Moyderwell acquired full Secondary School status under the principalship of Sr. Madeline Kelleher. Sr. Xavier O’Sullivan (1969-74) Sr. Kathy Cunningham (1974-’82) and Sr. Bemadette Costello (1982-2001) oversaw all developments and improvements since that time. 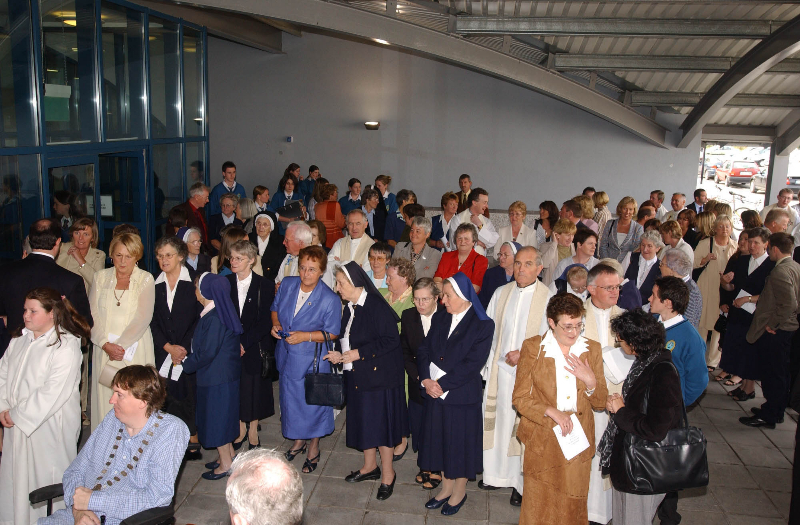 Sr. Bernadette with the staff and Mercy order management, made the historical decision in 1985 to go co-educational, making Moyderwell the only co-educational convent secondary school in Tralee. BALLOONAGH Secondary School began as a “Secondary Top” attached to the Convent National School in 1925. In common with most of the state’s post primary schools, it catered with great devotion and few resources for the pupils in its care. In 1952, it became an independent Secondary School as Mean Scoil Eoin Baiste, with an enrolment of only 60 pupils and a staff of four nuns and two lay teachers (Eilis Hartnett and Mary Sheahan). When Donagh O’Malley announced the opening up of post primary education just a generation ago, it brought the masses into the classroom. 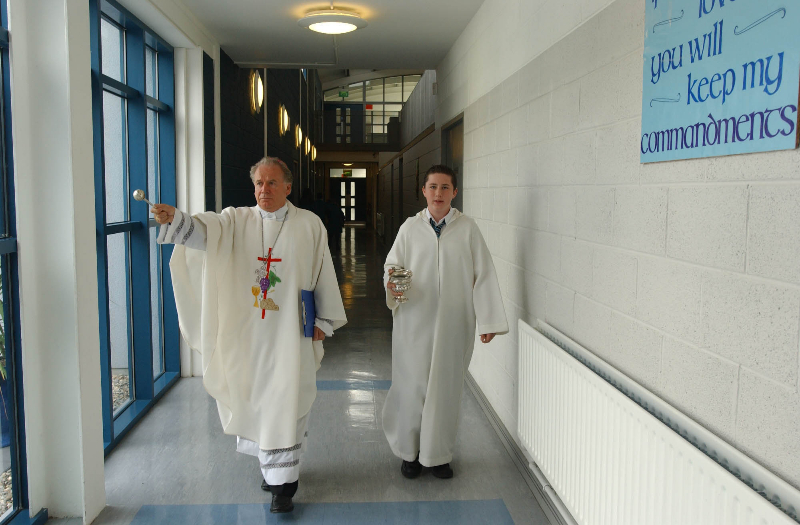 In Balloonagh, Sr Consilii Moynihan embraced the new opportunities for her pupils with zeal. This noted principal welded the new departure onto the caring philosophy of Balloonagh’s camogie champions. her order’s founder, Mother Catherine P.McAuley.While she saw the need for excelling in the field of academic results, and the growing opportunities of the jobs market, her vision remained – clearly on the goal of developing the personality. Towards the end of the eighties it became evident that both Saint Mary’s, Moyderwell and Saint John’s Balloonagh needed serious repairs and expansion and negotiations began with the department of Education and Science. Niamh Breathnach was the education minister at that time and a compromise decision was reached. The Mercy Sisters were offered a new school on a green field site, too accommodate an amalgamation of both schools. After consultation with the staff and parents of both schools the decision was accepted. Both schools had embarked on a fund raising drive prior to the decision, to which parents and the people of Tralee and its catchment area responded most generously. Sr. Clare o’ Reilly was the Superior General of the Kerry Mercy sisters at the time. 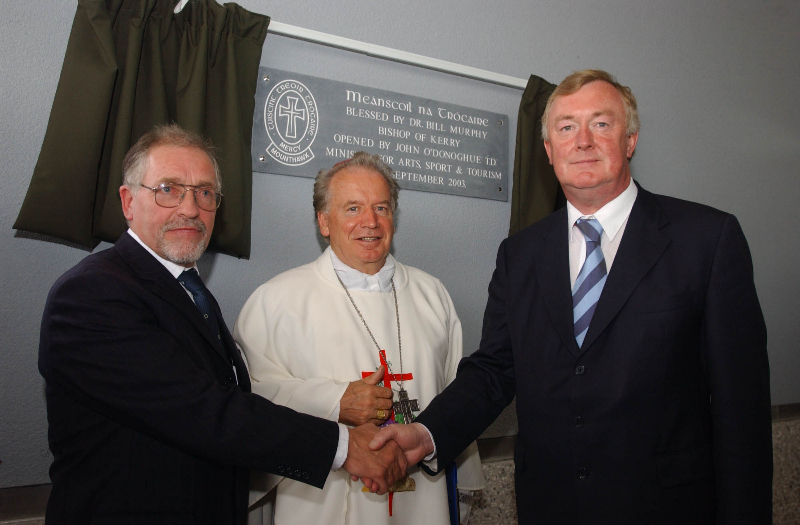 The golf club land in Mounthawk was advertised for sale in 1992 and sr. Clare, with the assistance of Michael Larkin, solicitor, Killarney negotiated the purchase of 16 acres, at a cost of €350,000 which was deemed a large sum of congregation money at the time. The fact that the site was owned by the congregation established the school as a Voluntary Secondary School under the management of the sisters of Mercy. The next stage was the appointment of architects. 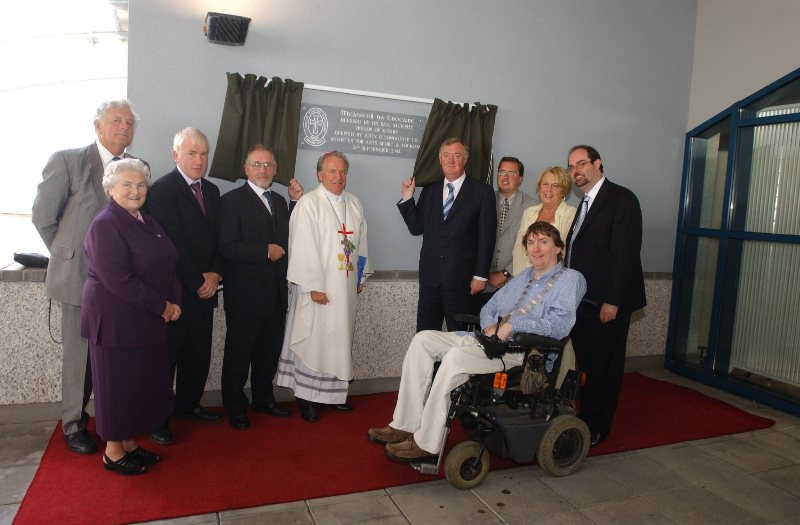 The services of O’ Riordan Staehli, were acquired, of which Mr. Donagh O’ Riordan is principal. After some research and considerable thought and discussion with the architects, it was agreed that the whole development should reflect the environment in whist the school was to be built and at the same time be innovative and modern. The round roof reflects the semi-rural aspects of the area and the landscape will be developed and maintained in keeping with the open parkland nature of the site. At this stage (1994) there was a change in the leadership of the congregation. The Mercy Sisters became a national congregation, forming a new structure which took some considerable time to establish. The plans were laid aside for most of two years. 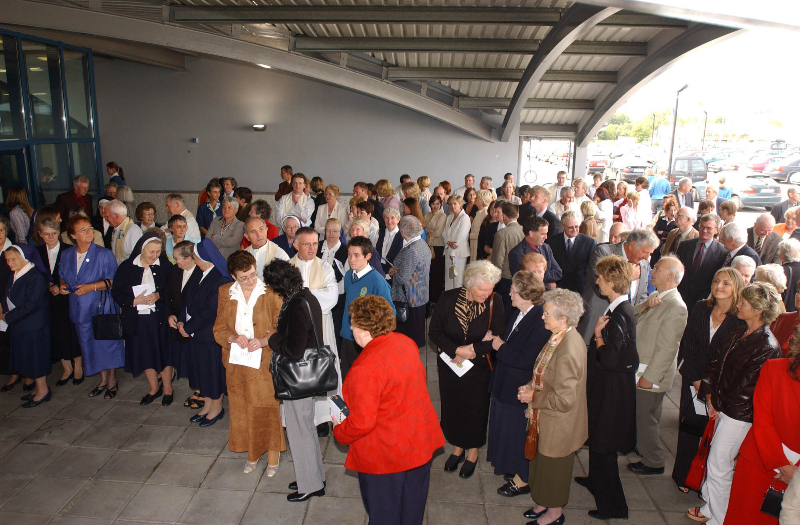 In October 1996 the leadership of the southern province asked Sr. Bridget O’ Flanagan to take responsibility for the project and the plans were handed to her. She proceeded to form a steering committee, later to become the Building and Finance Committee, to work together towards the completion of the task. She asked each of the existing principals: Sr. Assumpta Foley in Saint Johns and Sr. Bernadette Costello in Saint Marys, to nominate a parent and a teacher who were willing to serve. Mr Neal Timlin, Mr. Clayton Reidy (both parents) and Ms. Ena Harty and Mr. Michael Culloty (teachers) were nominated. It was an inspired selection, as the gifts and experience of each were complimentary, and each member of the committee had a sustained dedication and enthusiasm for the task. The congregation and the school community owe a lot to these dedicated volunteers, who as a committee oversaw every stage of the development; and this is here acknowledged by the Sisters of Mercy. 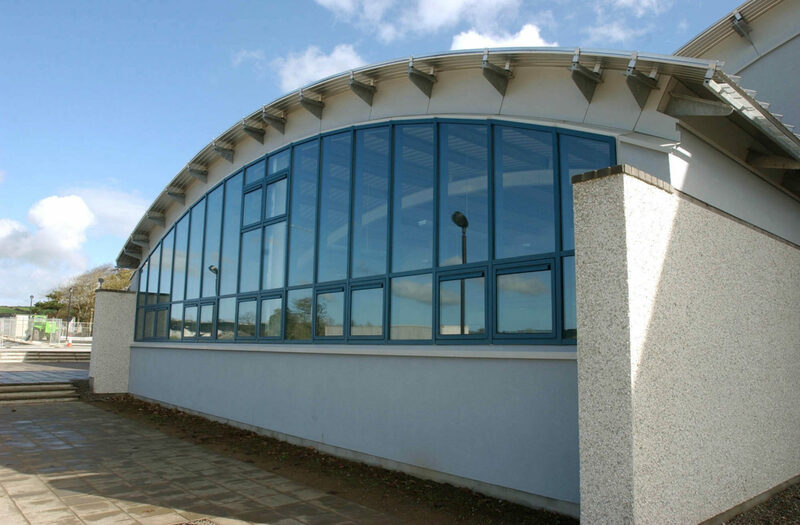 The work entailed long meetings with architects, builders, the Department of Education in Tullamore and in Dublin, negotiating grants, following up on promises. It was in the capacity of this committee to attend to every detail of planning and execution, and all thanks to them that Mercy Mounthawk is such an outstanding school buildings which serve the needs of teachers, parents and students for the foreseeable future. The builders, appointed by the tender process were Mr Ned O’Shea & Sons, Tralee, and the project was well served by him and the other professionals: Kane, Crowe, Kavanagh Quantity Surveyors, Malone, O’Regan, McGillicuddy structural Engineers and John O’Donovan Associates Service Engineers. 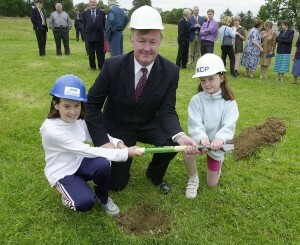 The sod was turned while Mr. John O’Donoghue, Minister for Justice, on the 7th July, 2000 in the presence of an illustrious gathering of all interested parties including parents, teachers, Sisters of Mercy, students as well as representatives of the Local Authority. The building was completed more or less on schedule and ready for occupation on opening day, September 2002. 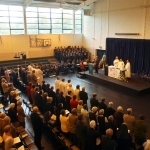 The first official function was a celebration of mass for staff and friends, to ask God’s blessing on all those who would pass through the portals of the school in the years ahead. There was a staggered entry that first week, to facilitate the settling down process. This process was greatly facilitated by work previously carried out by Margaret Crowley, Sean Geary, Mary McGillycuddy and Sean Coffey – main steering committee – and by the other voluntary committees within both staffs who attended to matters such as curriculum, policies, uniforms, timetables and so on. The staff at Mounthawk deserves great credit for the manner in which they have adapted to the change, through co-operation and hard work that ensured that the first year was a great success. Likewise the trojan work carried out by the then newly appointed Principal, Mr. Tony Behan, and Deputy Principals, Mrs. Kathleen Rice and Mr. John O’Roarke, particularly during the summer of 2001, was most significant and without their sterling efforts the opening day in September would not have materialised. 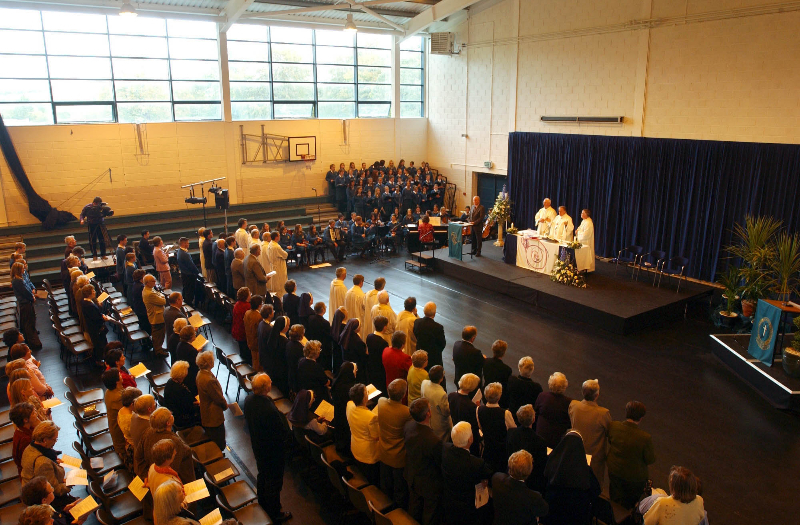 The support and direction provided by the Board of Management, under the chairmanship of Sister Ella McGuiness, was another vital and essential component of both the opening and the successful launch of the school. 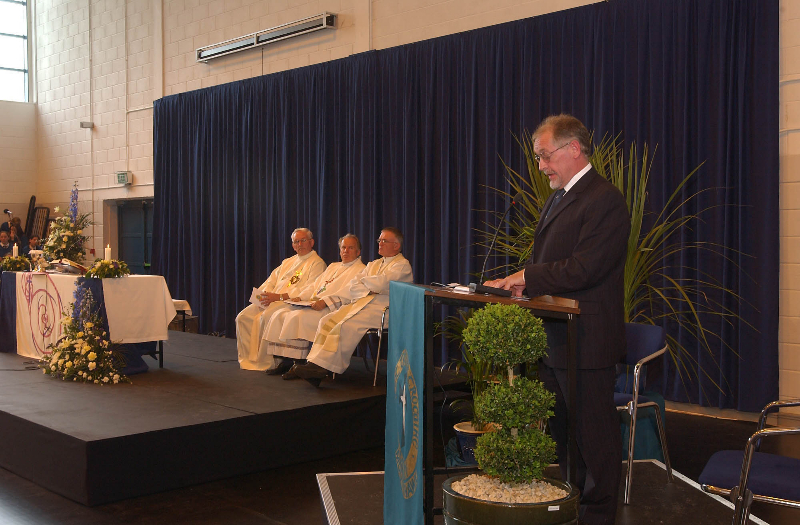 The official opening of the school was an important day presided over again by Minister O’Donoghue and Bishop Murphy. Have a look at the slide show…. In the preparation of the site for the new school at Mounthawk, EACHTRA Archaeological projects made exciting archaeological discoveries. 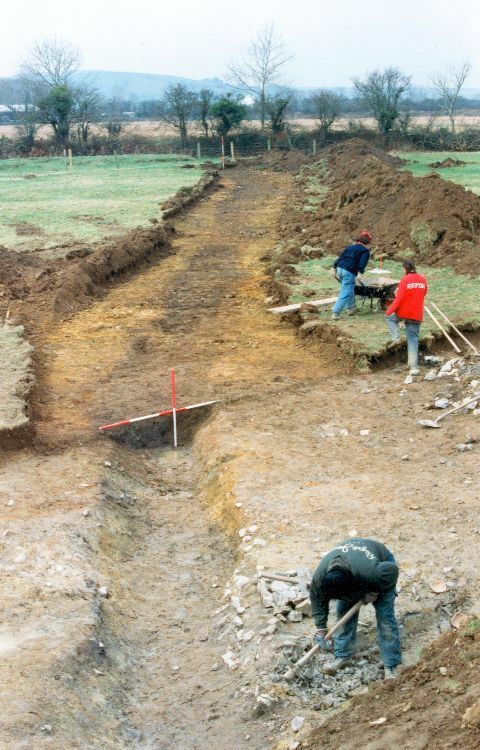 The excavations were carried out in 1996, 1997 and 2000. Mounthawk provides an important contribution towards understanding the lifestyle of prehistoric people of Kerry. The earliest archaeological finds from Mounthawk appear to date to the Neolithic. The discoveries indicate that approximately 5000 years ago the dead were cremated and buried at Mounthawk. The Neolithic archaeology consisted of eight pits, some of which contained cremated human bones. The cremated bones belonged to a teenager who was between 12 and 15 years old when he/she died. After the adolescent was cremated, the bone was divided and placed in four different pits in the ground. One of the pits contained Hazelnut shells, charcoal and burnt seeds in addition to the cremated bone. The seeds were identified as barley and oats. Smaller quantities of blackberry and elder seed were also present. Barley and oats were and important food crop during the Neolithic. The burnt seeds may have been placed in the pits as a ritual offering or as food for the dead. A wonderful kite shaped flint arrowhead (see MOUNTHAWK ARTEFACTS) and three sherds of Neolithic pottery were found with some cremated human bone. These artefacts may have been buried in the pit as ritual gifts to accompany the dead person on their journey to the Other World. A fulacht fiadh or burnt mound was also discovered at Mounthawk. These are the most prehistoric monuments found in Ireland and usually date to the Bronze Age. Fulachta fiadh generally consist of a mound of burnt stone located around a central water filled trough or pit. Stones were heated in a fire and thrown into the trough to heat or boil the water. Through time, the waster of shattered stones and material from the fire build up to form the large mound. There were many uses for Fulacht fiadh but they are most commonly associated with cooking. Charcoal from the pit of the Fulachta fiadh at Mounthawk was radiocarbon-dated to (2580 BC to 2030 BC), straddling the end of the Neolithic and the start of the bronze age period. During excavations, two cremation burials were also discovered at Mounthawk and were radiocarbon-dated to the Bronze Age. The cremations indicate that approximately 3500 years ago, Mounthawk was use as a burial place for the dead. 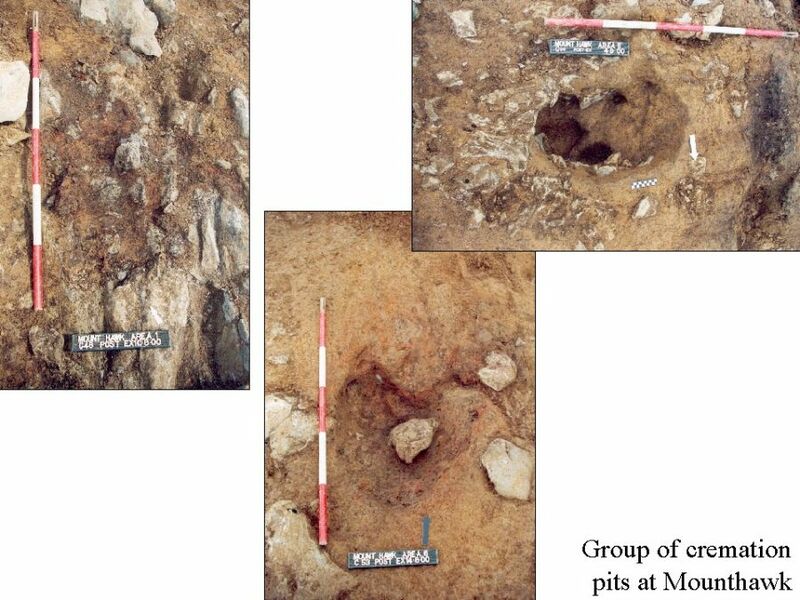 Bronze age burials are rare in Kerry and therefore Mounthawk is a very important site. In fact, the Mounthawk flat cremation cemetery is the first of its kind found in Kerry. Cremation Pit 1 was filled with the cremation bones of an adult human. The cremated bones from cremation pit 11 were also those of an adult. This person arthritis during his or her lifetime. The arthritis developed as a result of hard agricultural work. Sherds of Bronze Age pottery (see MOUNTHAWK ARTEFACTS), a fragment of Quartz and charcoal were also placed in the pit with those burial. A pit beside the cremations contained debris and charcoal from the cremation pyre. Charcoal from this pit was radio carbon dated to the Bronze Age (1560 BC to 1470 BC). To cremate the two individuals at Mounthawk, the bodies would have been placed on pyres. The pyre would have consisted of layers of wood stacked on top of one another. Fuel would have been added regularly to the pyre to maintain temperatures of around 800oC. The flesh of the corpse would have ignited. The entire cremation process would have taken 7 or 8 hours to complete, by which time the bones of the skeleton would have shrunk by 25%. After cremation, the white fragments of bone would have been carefully picked out by hand and separated from the ashes and charcoal. The collected bone was then buried in pits in the ground. The Mounthawk cremations indicate that the people who cremated the dead were knowledgeable and experienced in the processes involved. They knew how to prepare a corps and set up the pyre. They also knew how to manage and control very high temperatures. The Stokes family used the name \Mount hawk however, in maps dated 1853 and 1938, the area was called Mounthawk. George day Stokes(1800 to 1882). Son of Oliver stokes and Elizabeth Day. First cousin of david Moriarty, Bishop of Kerry. Married to Mary anna Baret, Horstead hall, Norfolk. They had nine children, many of whom had distinguished careers in the British army and Navy. He built Mount Hawk on land purchased from the estate of Jeremiah Mc carthy, Clogherbrien, who died 1839. He bred several famous racehorses. “The liberator won the grand national in 1879. Other famous horses were ‘Sizar’, ‘Day stokes’ and ‘Valentine’. Tralee races were held on the Mounthawk course between 1842-1884 he was treasurer for Kerry. His brother, major general John Day stokes, lived in Lassinagh House, spa. Edward George Stokes (1844 to 1925), son of George Day Stokes, lived in Mount Hawk until his death on the 3rd December 1925. He had no family. Henrietta Elizabeth stokes (1863 to 1947), only daughter of Henry Bowles Stokes, (son of George day stokes) was the last occupant of Mount hawk. She never married and died on the 6th October 1947. World war two during the Emergency Period (1939 to 1945) Army and Field Excercises were carried out at Mounthawk. Tralee golf club: 1948 to 1984 Elizabeth Stokes died in October 1947. In November, Tralee Golf club bought the land and house for £5,500. It was decided to sell the 25 acres north of the railway line. A nine hole course was designed by Mr. McAllister of Royal Dublin on the remaining 63 acres. The first round of golf was played there in 1948. Tralee Golf Club enjoyed a boom period in Mounthawk to 1984. However, an 18 hole course was needed and Mounthawk was put up for sale. The final round of Golf was played on September 1984. The Golf Club moved to Barrow. The land was sold in three separate lots between 1981 and 1986. The final lot of land included the House. On the night of the 14th of May 1993, the House was destroyed by fire. All that remains today of Mounthawk House is part of the Orchard wall…. In 1992, the Sisters of mercy bought 16 acres to build a Secondary School at Mounthawk. St. John’s Sec. School, Balloonagh and St Marys Sec. School, Moyderwell were amalgamated in September 2001. Mercy Secondary School, Mounthawk was inaugurated thus beginning a new chapter in the history of Mounthawk….